Hey moms on the go! As much as we would like to, it's nearly impossible to be with your kids every second of every day. Whether you're working, traveling, or simply out and about getting things done for the rest of the family, while you're out and about you still want the peace of mind that your child is safe and well taken care of. This is especially true for new moms and moms with infants. I recently partnered with BabyBit, a groundbreaking new smart + mobile baby monitor that's launching via an Indiegogo crowdfunding campaign soon and helping moms around the world stay connected to their babies while they're away. You won't have to wait on a text or phone call to know that the baby got picked up from daycare on time and is headed to grandma's house. With a quick glance at your mobile notifications, your mind can be put at ease. If you're not at home, it does you no good to know every single time the baby cries, but with BabyBit you can set your notifications to alert you if the baby's been crying for a period of time that you think is too long or unusual. Should the baby roll over on its stomach during a nap, the caregiver will be alerted immediately. If the baby stays on its stomach (for a period of time that you set), you'll be notified as well. Aside from the notifications, there are more details available within the app. There you can see if the baby is awake or asleep and content or crying. You can also get insights into how attentive the caregiver is and what the baby's disposition has been while they've been with the caregiver. I'm personally excited for BabyBit to hit the market and I know many of you will be too. It's a must have for any mom with a young baby (and it would make a great gift)! That's why I'm encouraging you to support their Indiegogo campaign, which launches on June 20th: The faster they reach their goal, the faster you can get your hands on a BabyBit. For more information about BabyBit and to sign up for their email updates, please visit . 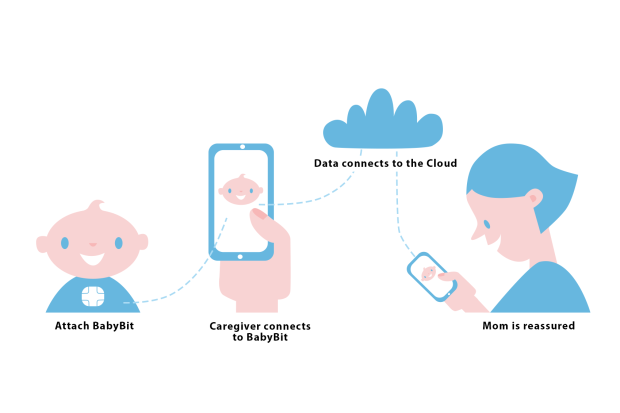 In the meantime, I'd love to hear what you think about BabyBit and any tips you might have for moms on the go to stay connected to their babies when they can't be with them. I wish we had access to monitors such as this 30 years ago. I do have one that I use with my granddaughter. I have a video monitor with sound and works with 4 cameras. I love it. I never leave my kids so this app would be better for a working women or a women in school. Pretty cool how far technology has come. Wow!! Nifty device, I wish I had one with all my kiddos, would have made me worry a little less! !